Product Consist: Armaf Enchanted Intense Deodorants (Weight: 200 ml), Small Teddy Bear (size: 3.5 inch), Personalized Message Bottle (Special Instruction: Personalized Text Message for MOM accepted maximum 25 characters only), Leaf with Smile Flower Key Chain along with Mothers Day Greeting Card. 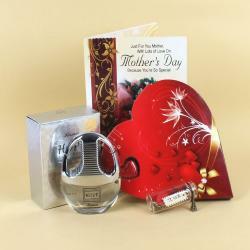 Gift your mother this amazing hamper which has Armaf Enchanted Intense Deodorants, Small Teddy Bear, Personalized Message Bottle, Leaf with Smile Flower Key Chain along with Mothers Day Greeting Card gifting combo for Mom. The Armaf Enchanted Intense of the deodorants will attract the attention of all and will be appreciated. As important as a long-lasting deo is, looking for it need not necessarily be too difficult for you. Small cute teddy with key chain and card is best gift for mom. This Scroll Bottle gift is perfect for gifting someone special or for you to keep your mini secrets. Also a unique way to say Happy Mother's Day. This special hamper will be loved by your mother and will be used daily. Everyone loves to receive a card, either through the post or by hand. In this crazy fast, faster, fastest instant world that we all live its worth reflecting that the greeting card is still considered by most as the truly effective way of telling someone you really care. Product Consist: Armaf Enchanted Intense Deodorants (Weight: 200 ml), Small Teddy Bear (size: 3.5 inch), Personalized Message Bottle (Special Instruction: Personalized Text Message for MOM accepted maximum 25 characters only), Leaf with Smile Flower Key Chain along with Mothers Day Greeting Card.